Gutted i missed out on this hive with installation deal on Amazon a few days ago but just noticed its just gone back down to £139.99. Can this system be used with a combi boiler? I've got a combi boiler so i checked a few forums & they say yes but you only need it for the heating because water is already on demand with a combi. You just need to go online to see if your boiler is compatible i think there's a few wocester ones that aren't. I had a Nest system in my old home, how do these compare? Was going to go Nest again but this is a steal with the installation included. Can you get this installed in Northern Ireland? Thanks. Been waiting ages then missed the other deal. I went for the Tado as I didn’t have any existing wiring so needed something battery powered. Don't buy the warehouse deal one's as the codes for the installation Don,t work. Agree, very easy to install. Helpful customer support. Also way ahead of the Hive app. Great system, I highly recommend it, especially at that price!!! I've been really happy with mine and paid £156 last prime day. This is a bargain! What would you say is the best part of the system? Showing for £199.99? You have the right link? It's gone from Amazon's own stock. Still available from 3rd parties and Warehouse At variable prices. The Hive thermostat is battery powered, too, but then has a wired bridge to the boiler. However, all systems need some kind of wiring in to your boiler in order to connect, whether it's using existing wiring or new, so you must have swapped out an existing thermostat/programmer? I had a Nest system in my old home, how do these compare? Was going to go …I had a Nest system in my old home, how do these compare? Was going to go Nest again but this is a steal with the installation included. Nest has always been a smart learning system and senses when you're in etc. to adjust temp. 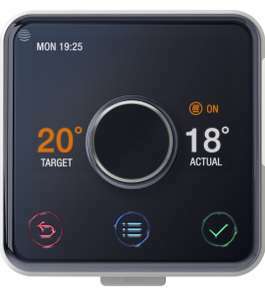 Hive is more like a traditional thermostat/programmer, but with remote capabilities, which is what I wanted and got a self install version 1 for £60 off here last year. They have more recently introduced a smart "reach temperature by certain time" ability where it learns how long it takes to reach your set temperature and then adjusts when heating comes on, rather than always coming at 6:00, e.g if house colder overnight than before, heating should start earlier. I also believe Hive had good Alexa integration, but don't know about Nest. Just ordered a uses as new - hoping it's still free installation as it leads you you think so? Brilliant price...Got this for £159 with Installation in January and thought that was as good as it would get. Really pleased with it. Heat added. Don't buy the warehouse deal one's as the codes for the installation Don,t …Don't buy the warehouse deal one's as the codes for the installation Don,t work. If you buy a warehouse one , and the code does not work , can you return it for a full refund ? Depends on your boiler, the Hive is just an on/off switch whereas the Nest is an Opentherm controller and far from just an on/off switch. I've got an oil boiler and it works great with that highly recommend and a great price. If you buy a warehouse one , and the code does not work , can you return …If you buy a warehouse one , and the code does not work , can you return it for a full refund ? Lett me know if instalation code works, Cheers. OK so mine arrived today (purchased amazon warehouse one). Seems a cheeky monkey had bought it, scratched off the cover of the installation code, used that for some nefarious purpose then sent the kit back to amazon (and i assume got a full refund). So when i called just to arrange installation they mentioned that code had been used. The kind lady asked me to forward a copy of my reciept (showing "with installation" i guess) and within 48hrs i should have a new code generated for me then i can book the team out. Clearly this has just happened but i will come back and edit this post with the outcome. Same here. Bought a like new from Amazon warehouse. Code was scratched off. Hive have booked me in for Tuesday next week with me emailing proof of my purchase showing it was bought 'with installation'.